AE - Post Meta widget is used when you want to display Post Meta data like Date, Category, Author Name, Tag or Comments to your Post/Page layout. AE - Post Meta widget gives you many options under the editing section. Layout: Layout gives you the option of displaying the content either Vertical or in Horizontal mode. Category: It is used to sort and group the content into sections. Icon: under the icon, you can choose any icon you want to show with your category. Order: In this, you can decide that on which no/order your category will be displayed. Disable Link: By default, the link for the category is shown if you want to disable that link then you can use this option. 3. 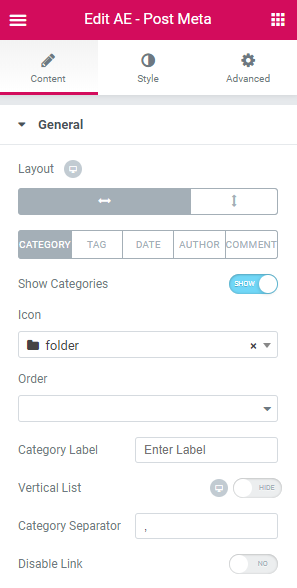 Tag: Tags are used when you want that topic to be searchable. 4. Date: It is used When you want to show a date on your post. 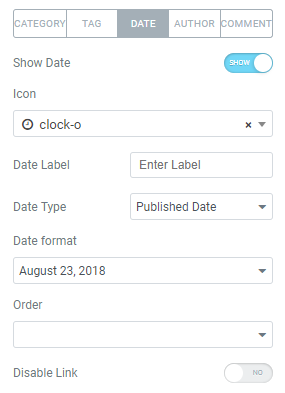 Date type: Choose date type to publish your post on. Under this, it gives you two options i.e. Published Date: In this, the Post Publish date will be displayed. Modified Date: In this option, you can modify the date as per your choice. 6. Comment: It is used when you want to Display/Disable the comment on your post.